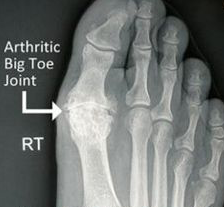 Do you have arthritis of your Big Toe ? CARTIVA is the latest advancement in treating big toe arthritis. Hallux Rigidus is a termed used to describe arthritis of the big toe (1st MTP Joint). Characteristic symptoms include pain while walking, stiffness, and difficulty with footwear. Traditional surgical techniques have included fusing the arthritic bones together to alleviate pain. While this is certainly a valid treatment option for some, many patients are looking for a technique that allows pain relief AND preservation of joint motion. Enter CARTIVA. Hallux Rigidus can affect both men and women, and may be present in one or both feet. It can be found in patients that have a tendency to develop arthritis in other areas around the body, or may present as an isolated location. As the severity of the arthritis increases, patients typically develop progressive stiffness within the big toe (1st MTP joint) and difficulty mobilising. ‘Deformity’ and bone spurring may also be present. What is CARTIVA and how does it work? CARTIVA is a synthetic hydrogel cap made from a similar material to contact lenses. 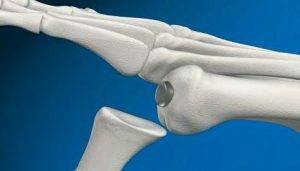 The ‘Cap’ acts as an interposition within the big toe (1st MTP) joint and prevents the painful arthritic bones from contacting each other under pressure when walking. Because the joint is not being ‘fused’ together, patients gain both pain relief and maintain range of motion within the joint itself. 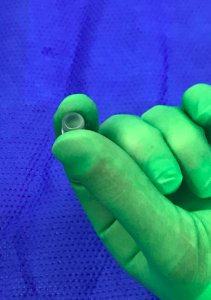 A CARTIVA implant is inserted as a day procedure, and patients are able to weight bear immediately following this technique. Associated bone spurs (osteophytes) are removed as part of the technique. Early joint movement is encouraged. What’s new on the horizon? Do you have big toe arthritis? Visit us on Facebook to "Ask the Surgeon"
Want to ask us a question? Visit us on Facebook and post your question. Your questions will be public, and answered as soon as possible.